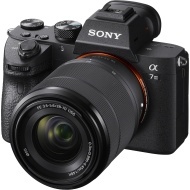 alaTest has collected and analyzed 175 reviews of Sony Alpha a7 III. The average rating for this product is 4.8/5, compared to an average rating of 4.3/5 for other Digital Compact Cameras for all reviews. People really like the design and image quality. The price and performance also get good opinions, whereas the storage and shutter get critical reviews. Opinions are divided on the portability. We analyzed user and expert ratings, product age and more factors. Compared to other Digital Compact Cameras the Sony Alpha a7 III is awarded an overall alaScore™ of 99/100 = Excellent quality. The Sony Alpha A7 III might not have the highest resolution, fastest shooting speed or best video quality. But by borrowing features from the flagship A9 and A7R III, it's uniformly excellent at everything. A simply excellent full-frame camera at the price. Sony A7 III. Simply put, the Sony A7 III is the finest example of the most affordable full-frame camera on the market. It’s a sensational camera for the money and compliments the ever-evolving Sony A7-series quite brilliantly. The Sony a7 III is an entry-level full-frame camera that goes well beyond the basics in features, with excellent image quality, 10fps subject tracking, and 4K video capture. 24MP full-frame BSI sensor. 10fps with tracking. 5-axis stabilization. 4K HDR video. Silent shooting available. Tilting touch LCD. Dual SD slots. Vastly improved battery. Focus joystick. Flat profiles available. Screen not true vari-angle. Only one card slot is UHS-II. No in-body flash. Accessory required for time-lapse. Shooting buffer must clear to start video. Dense menu system. Omits PC sync socket. Our review of the Sony a7 III is well underway and, as part of this, we're publishing our studio test scene. We'll be building out the review in the coming weeks as we test and shoot the camera in a series of situations. Sony's replacement for its entry full-frame mirrorless model gets major boosts to speed, battery life, quality and features.